Former Honda factory rider Keith Amor is set to make a renewed road racing challenge this season. The 42 year old Scot, who made his initial comeback last year after a shoulder injury forced him out of the sport in 2011, will return to the premier class on a 2015 spec BMW S1000RR at the Isle of Man TT Races fuelled by Monster Energy. 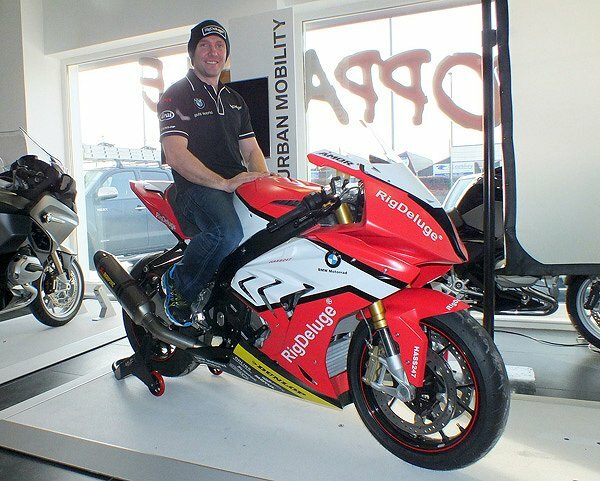 Enjoying backing from RigDeluge, a fire suppressant safety systems company in the oil and gas industry, the former Supersport TT podium finisher will also have a brace of World Supersport spec CBR Hondas for the 600cc class. "I will have six bikes in total, three BMWS and three Hondas." Amor explained. "The plan is to have two stockers, one set up for the dry and the other for the wet, alongside the superbike. I am getting Motorrad support from Germany with engines, electronics and data and we will run Ohlins factory suspension on all the bikes." With his shoulder now fully repaired following two major operations, Amor says he wants to emulate his 2010 season that brought him international wins at the North West 200 and Ulster Grand Prix. "That was my best ever season and I want to go back to what I know and what I ran then." he said. "I was on a low budget in 2010, it's anything but that now." he explained. I am in a really good position and this is my job for the next two years. I have my brother Guy as my mechanic setting the bikes up for me and I just have to build myself up to race speed." Amor's first test will be at Cartagena in March and he will take in the Easter short circuits meetings at Bishopscourt and Kirkistown before returning to the roads at the Tandragee 100 in May. "I like Tandragee and it is a good place to sort out if the bike is going to work at the TT." he says. In spite of finishing on the TT podium five times, a Mountain course win still eludes the Stirling based racer and remains the principal goal for 2015. "I would like to get a TT win and then I could retire happy." There will be no return to the smaller class that he made his racing comeback in last year, when he finished fourth in the Bikenation Lightweight TT Race following two top ten finishes in the Supersport class. His fastest lap around the Mountain Course, 130.177, his only 130+mph lap, was set on his final lap on a Superbike, the 2011 PokerStars Senior TT, when he finished in fifth place. Despite not racing a 1000cc bike around the Isle of Man since 2011, his fastest lap places him 14th on the all-time list of fastest laps.